FORT WORTH, Texas. — Ed Wadley, owner of Taylor’s Rental Equipment Co. thinks big. “When Hurricane Sandy hit the East Coast I had stump grinders up in New Jersey for about three months each,” he said matter-of-factly, as if it’s normal for a modest rental company to send equipment 1, 200 miles away. I’ve been renting Bandits for about 10 years now. You could walk in here any day of the week and I’d have two or three of the chippers out, and the stump grinders go out more often than the chippers. Truth is, for storms like Sandy, it’s not uncommon for rental companies to have such long-distance deals. But again, Ed thinks big and that’s certainly helped Taylor’s Rental stand out among their competition. Whereas most rental shops carry smaller brush chippers and stump grinders, Ed’s fleet runs the table for Bandit hand-fed chippers. He has the smaller rental favorites like the Model 65XP, 75XP, 90XP and a few 250XPs, but he also rents Model 1390s, Model 1590s, Model 1890s, and the largest hand-fed Bandit chipper you can get – a 21- inch capacity Model 1990XP. Okay, so if you’re keeping track, this Texas-based rental company sends stump grinders to New Jersey and chippers to South Carolina. That’s not a bad spread by any stretch – with that kind of customer support and willingness to go big, it’s no wonder the company has been in business since 1953. And business is booming; Taylor’s Rental employs 80 and uses 50,000 square feet of space to serve its customers. And while there are some truly long-distance rentals as previously mentioned, Ed says the vast majority of their clientele are in the North Texas region, Louisiana, Arkansas and southern Oklahoma. Still, that’s four states. Serving such a large territory can be daunting for any rental organization. Helping Ed and his team at Taylor’s Rental is Bandit’s nearby dealer, Bandit of Texas. 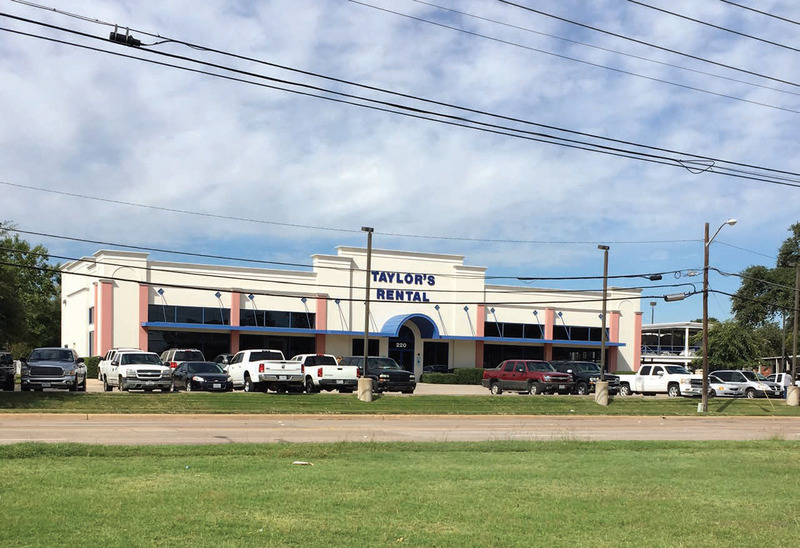 The relationship between Taylor’s Rental and Bandit of Texas spans years, going back to when the dealership was known as Poston Equipment. With well over two decades of service to Bandit customers in the region, Bandit of Texas provides an excellent support base for Ed and his large Bandit fleet. I rent higher-horsepower stump grinders than anyone else; I carry Model 2550s with 44 horsepower and Model 2650s with 61 horsepower. Nobody else in my market will do that. Ed says the larger chippers and stump grinders are rented mostly to tree companies, and to a smaller extent, landscaping companies. He estimates around a dozen regular customers for the bigger equipment, including the aforementioned client who uses the Model 1990XP. As expected, the smaller Bandits typically see homeowner use. “I’ve been renting Bandits for about 10 years now,” said Wadley. “You could walk in here any day of the week and I’d have two or three of the chippers out, and the stump grinders go out more often than the chippers. Regardless of the size, they’ve been good investments for Taylor’s Rental. 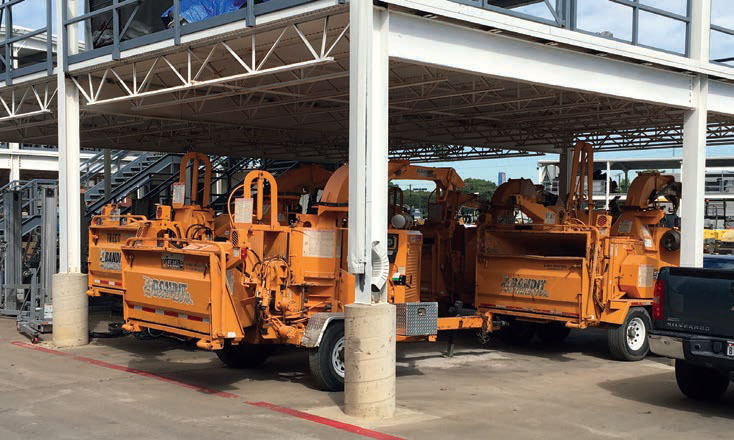 Equipment maintenance is something that Ed stresses as vital to being successful in the rental business, but it’s especially true with chippers. That can be frustrating to some who prefer ‘hands-off’ operations, but Ed also points out that return on investment can be much more lucrative with chippers. My initial cost recovery is 24 months, but that’s more towards the bigger chippers. On a 6-inch chipper like the Model 65XP I can do it in 18 months at the most. As successful as Taylor’s Rental is with their fleet of Bandits, diversification is the major factor in the company’s success. In addition to a very wide range of tool and construction equipment, Taylor’s Rental also maintains a special events portion that can turn any backyard into a five-star entertainment venue, complete with tents, dance floors, stages, audio equipment, and even a dunk tank for splashing the boss during the company picnic. At this point it would be very easy to bring up the classic cliché of not putting all your eggs in one basket. That certainly holds true, but talking with Ed it becomes clear that the success of Taylor’s Rental isn’t about diversification, or customer service, or thinking big. It’s a combination of all three, infused with a certain level of modesty that keeps companies in-check. Each day starts with customers walking through the door – get them what they need. If you don’t have it, consider getting it. When customers started asking for bigger chippers, Ed took an extra step to make that happen. And the payoff has been worth it. Thanks Ed! That number he spoke of is 1-800-952-0178. Give us a call to learn how Bandit can help build the bottom line for your rental company.